The ATP World Tour made the transition from the Grand Slam fervor of Wimbledon to a trifecta of smaller events in Bastad, Newport and Umag. Here is a recap of the results of the past week as we sink our teeth into the summer. Impressively voted by the players as the 250 level tournament of the year between 2002-2011, it was captured this year by someone who enjoyed much success over that time period but not so much as of late. David Ferrer won his first Tour title since 2015 and sent notice that Roger Federer is not the only 35 year old who can still handle his own on a tennis court. It was the third time that Ferrer has hoisted the trophy in Bastad with previous wins in 2007 and 2012. We shall see if he can keep the five year pattern going and win one at the age of 40 in 2022! This time Ferrer took out Fernando Verdasco in the semifinals and then Alexandr Dolgopolov in the finals to take the tournament. The win bumps him up 13 spots in the rankings and within striking distance of a seeded spot at the U.S. Open later this summer. 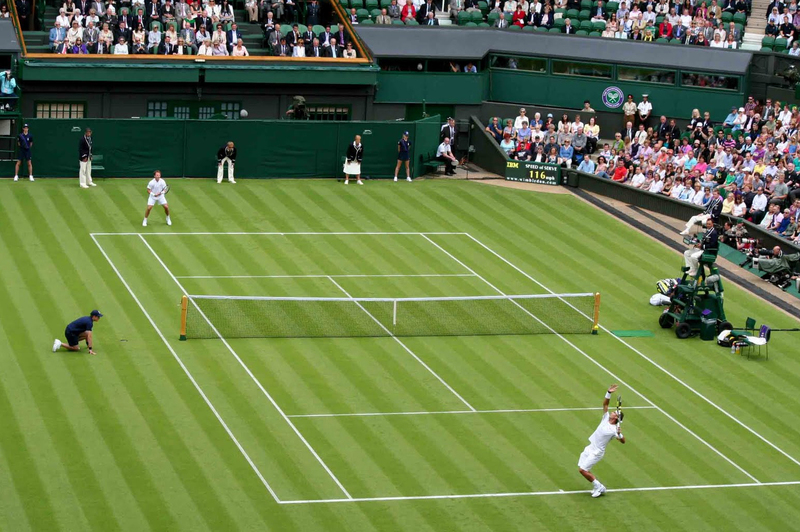 Continuing the trend of players who had not won a title of late, American John Isner used his commanding serve to his advantage on the grass in Newport. Isner had won a tournament every year from 2010-2015 but after winning in Atlanta two years ago he had come up empty. At the age of 32 and with his limitations being what they are, it is unlikely we will ever see the 6'10'' Isner ever win a Slam but he should be able to pull off at least a level 250 event with that serve being the weapon it is. When you see that Ivo Karlovic is doing just fine ranked 29th in the world at the age of 38, Isner should be able to continue his career for several more years. Not to take away from Isner's accomplishment but his opponents en route to the trophy were not exactly guys who should have given him trouble. It only took four wins for the championship and three of those were against opponents who were ranked outside of the top 200 in the rankings. Newport is the third grass court tournament win of Isner's career with all of them coming at this very same event. From two well known tennis commodities to a lucky loser of champions in Umag. Russian Andrey Rublev at the tender age of 19 reminded us that it's not just the over-thirty crowd that can achieve success these days on Tour. The youngest current player inside of the top 50 in the rankings overcame six different opponents (including qualifying) to win the first pro title of his young career. Most unsual was the fact that Rublev lost his final qualifying match (in straight sets) to Italian Attila Balazs but found his way into the main draw none the less. He took out known clay court guru Fabio Fognini in the quarters, veteran Ivan Dodig in the semis and Paolo Lorenzi in the finals by a score of 6-4, 6-2. His victory must have Russian tennis fans excited as there hasn't been much to talk about on the men's side in that country since Kafelnikov and Safin retired. Those two remain the only men's Grand Slam singles champions from Russia. Just a few weeks before turning 36, Roger Federer continues to play majestic tennis and managed to reach the semis at Wimbledon by crushing his opponent Milos Raonic with an emphatic 6-4, 6-2, 7-6(4)) victory in just one hour and 58 minutes. The Swiss maestro rolled the years back again and made a fantastic performance, especially in the first two sets, where he managed to eliminate Raonic’s serve hitting extraordinary returns, even though Raonic made 77% of first serves in the first set. His serve, volleys and groundstrokes worked excellently and he seemed so smooth and relaxed as if he was in a practice session. The stats for the first two sets were 27 winners and only 3 unforced errors! In the third set Roger showed some signs of nervousness and the 26-year old Canadian raised his performance by adding some variety to his serve and being more consistent. The first warning from Raonic came just in the second game with Federer saving a break point. The most impressive and crucial moment though was in the eighth game, where Federer made some serious unforced errors with the forehand and allowed Raonic to enjoy four break points, which seemed like set points. Roger found solutions and managed to hold serve for 4-4, leading the set to a tie-break, where he was obliged to make a small miracle again. Raonic was leading 3-0 in Te breaker but Federer replied with 5 consecutive points for 5-3 playing solidly on those crucial points, hitting an unbelievable passing shot with the forehand. He then made two great serves and completed his triumph 7-4. The next opponent for Federer in the semifinals will be 31-year old Thomas Berdych, who overcame Novak Djokovic (7-6, 2-0) after the latter retired due to an elbow injury. Andy Murray was also not able to qualify for the semis losing to American Sam Querry in five sets (6-3, 4-6, 7-6, 1-6, 1-6) and Gilles Muller lost to Marin Cilic in five sets as well (6-3, 6-7, 5-7, 7-5, 1-6), so the other pair of the semis will be Marin Cilic versus Sam Querry. A great opportunity to bet on this match, as there is no heavy favorite. You can bet in various online sites and casino games, such as Betfair Casino. Federer remains undefeated in big occasions in 2017 (only two losses on the year) and for the 12th time in his career is in the semifinals at Wimbledon, where he has a record of 10-1, his only loss was last year to Milos Raonic. If he beats Berdych in the semi-final, it will be the 11th time he qualifies in the final. The king of grass is two victories away from breaking a shared record with Pete Sampras and William Renshaw (7 Wimbledon titles) and becoming the first man to ever win 8 titles at Wimbledon, the most prestigious tournament in tennis with a history of 140 years.